Send us your Flex Cam footage and get a free hat or decal if we choose to use it on our site. The Flex Cam™ eliminates the need for a cameraman, tapes, DVD’s or the cost of an expensive camera. All that is needed is a cel/mobile phone with the capability to record video. Never before has the hunter been able to capture a hunt on video and send that hunt via Email or MMS Messaging to anyone, anywhere withing seconds. * Small and lightweight at less than 7 oz. 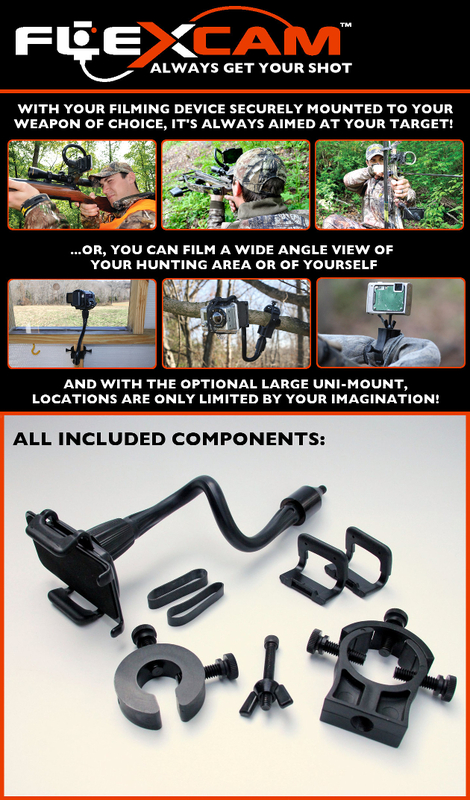 With the new Flex Cam Universal Mounting Bracket, you can now mount your Flex Cam on just about anything! 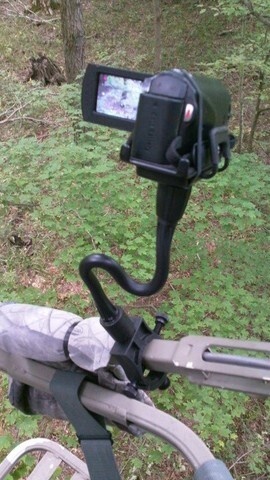 From trees to tree stands, and everything in between, the options are now limitless in being able to capture the hunt on your smartphone or compact camcorder. Watch any of our great Hunting Videos right here. We’ve got lots of ’em! There’s also a link on the top menu for “Videos” (Just in case you didn’t see that). Click here to watch Hunting Videos now.